If you're looking for the perfect romantic date, Café Nordo's latest production Sauced is that and more. Set in Seattle's historic Pioneer Square, it blends theater with great music, excellent food, unique alcoholic drinks plus just the right amount of time to talk between entertainment presentations. And that talk will be in a dimly lit, sultry environment perfect for romance or perhaps just reconnecting. 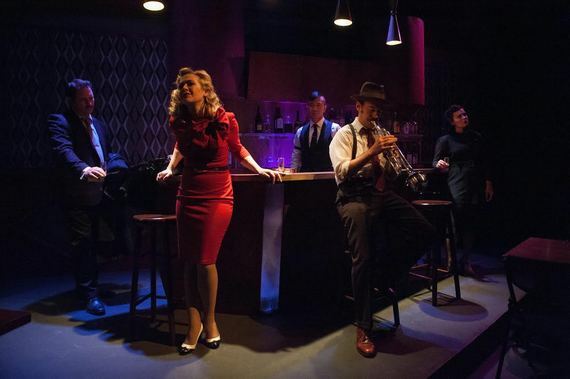 For this production, they've built Café Nordo into a thirties-style speakeasy with actors portraying characters who are also talented singers and musicians. One of my favorites was Evan Mosher brilliantly playing a drunken trumpet player with an incredible knowledge of history that he often shares with the audience. Seemingly drunk, when Mosher picks up his instrument, he captivates and transforms the environment. Also, superb are Opal Peachey and Mark Siano. These two multitalented people seem in constant motion as incredible singers, actors, hosts and even servers. Plus the entire production is backed up by a fabulous band that adds even more to the sultry romantic environment. "Set in a bar in Pioneer Square just after the end of prohibition, this seductive noir thriller infused with cocktails. ... Café Nordo has arrived at our historic new venue in Pioneer Square. With its 125-year history, The Globe Building, formerly a hotel, is just the type of place Sauced might have happened in 1937. ... we're thrilled to share this sell-out noir hit show with all of our new fans, as well as delight our long time followers with new songs, new characters, and new twists and turns that heighten the action. ... "Best Bartender in America" Murray Stenson has crafted a classic cocktail flight to pair with four courses reimagined from popular dishes of the day by Nordo's executive chef Erin Brindley. Award-Winning Composer Annastasia Workman has added original jazz numbers to make Sauced Café Nordo's most universally beloved production to date." All in all, I'd describe Sauced as the perfect local adult getaway and a destination must see if you're in the Seattle area. A table for two with dinner and the flight of drinks is about all anyone would need to kindle romance. Sauced continues at Café Nordo through December 20.